Beginner's Guide To E-Mini Futures Contracts: What Are The E-Minis? Beginner's Guide To E-Mini Futures Contracts: Who Trades The E-Minis? E-mini contracts are similar to other futures contracts in that they have a defined length and specified expiration. 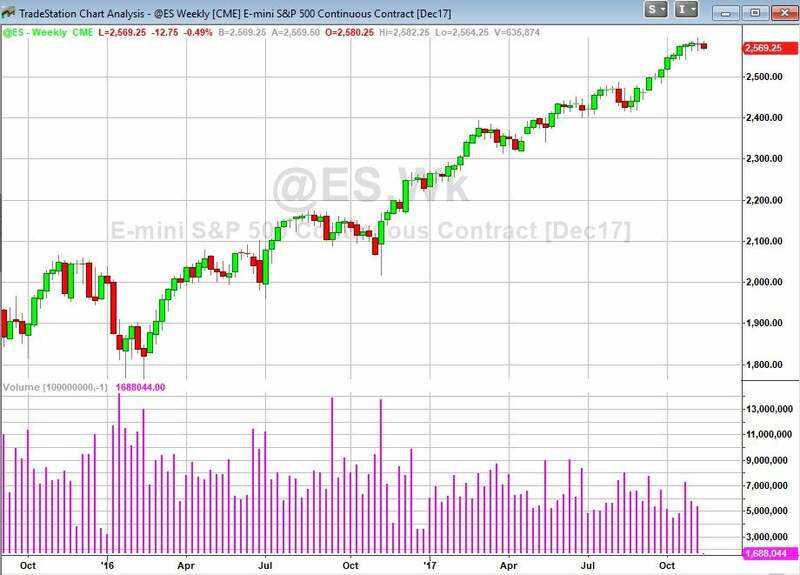 The e-mini stock index futures expire at the same time and price as their larger counterpart contracts (for example, the e-mini S&P 500 contract expires at the same time as the standard, full-sized S&P 500 contract). The expiration date (or final trading day) is the last day that a futures contract is valid. Since futures contracts have specific delivery months (i.e., H, M, U and Z), they expire, or stop trading, on a certain date. The final settlement price for the contract is also determined. Expiration for the e-mini stock index futures contracts (including ES, NQ, YM and RTY) falls at 9:30 a.m. Eastern Time on the third Friday of each delivery month, such as the third Friday in March for a March contract, or the third Friday in December for a December contract. When a contract expires, it doesn’t expire worthless like an options contract would. Instead, any open positions roll over to the next contract. The following chart illustrates typical changes in trading volume around a rollover date. 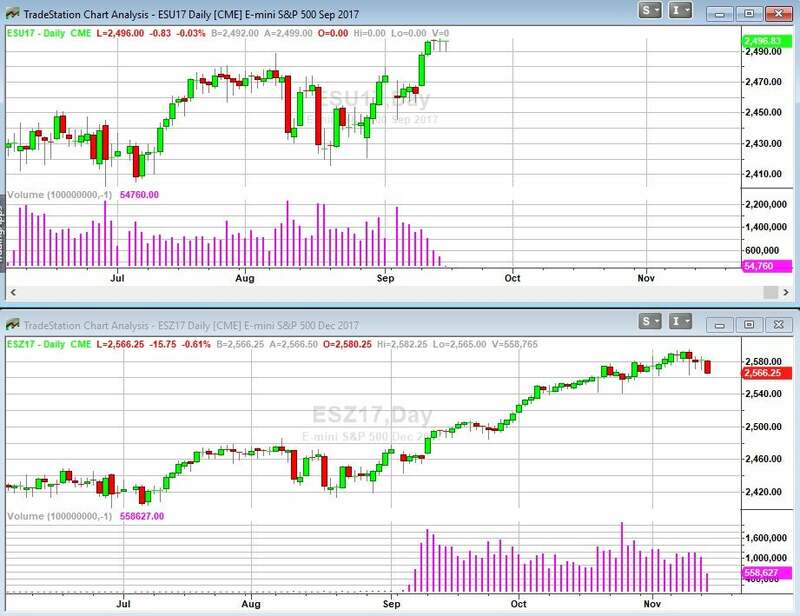 In this example, the September and December ES contracts are shown. Notice the increase in volume for the December contract (lower chart) that coincides with the rollover date, while volume for the expiring September contract falls. Volume moves to the new contract on the rollover date. Image created with TradeStation. Many active traders trade the "old" contract on Rollover day, and then switch to the "new" contract the next day, or make the switch on the actual Rollover day. In general, traders should move into the new contract as soon as volume moves from one to the other. Some traders avoid Rollover day altogether because it’s considered to be choppy and difficult to trade. It’s important to do your own homework and research to determine if your trading strategy is affected by rollover trading. The continuous contract is a combination of the various delivery months of a contract. It allows traders and investors to view historical price movements and apply historical technical analysis across multiple contracts. The continuous contract is vital to strategy development and backtesting since it’s the only way to see years of consecutive trading data. Often, the symbol for the continuous contract is the contract's ticker symbol, preceded by the "@" symbol. The continuous ES contract, for example, would be designated "@ES." The following chart shows the continuous ES contract. Notice that the chart appears as seamless as that of a regular stock chart. The continuous contract is used for analysis purposes only and not for actual trading. The continuous ES contract provides seamless data across multiple contract months. Image created with TradeStation. The e-minis are the small but mighty cousins of their larger, full-sized contracts. Learn how to trade with the e-mini stock index futures. Learn about the Dow Jones Index futures contracts available and obtain step-by-step instruction on how to trade the stock index futures.